LEWISTON, Idaho – CCI Ammunition, the only American manufacturer of handgun shotshells, introduces all-new handgun shotshells featuring larger shot for deeper penetration and extended range. They are available in four popular handgun calibers. Shipments of this new product are being delivered to dealers. Centerfire handgun shotshells have long proven themselves as highly practical options for close-range pests. 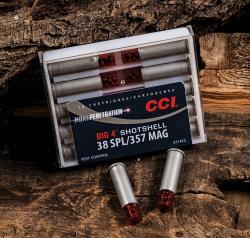 CCI has added to its one-of-a-kind offering with exciting new CCI Big 4 loads to extend the range and capabilities of these downsized shotshells, thanks to a payload of No. 4 lead shot. The resulting energy and patterns enable Big 4 loads to take down larger pests at longer distances, making them even more useful.